CONNECTIVITY MATTERS | B R O A D B A N D C O M M U N I T I E S | w w w. b r o a d b a n d c o m m u n i t i e s . c o m | J A N U A R Y / F E B R U A R Y 2 0 1 9 Broadband Strategy and Doughnuts When you can't fund a communitywide network, your best strategy may be funding today's best-served areas. By Trevor Jones / OTELCO F unding is one of the great challenges of municipal broadband projects. 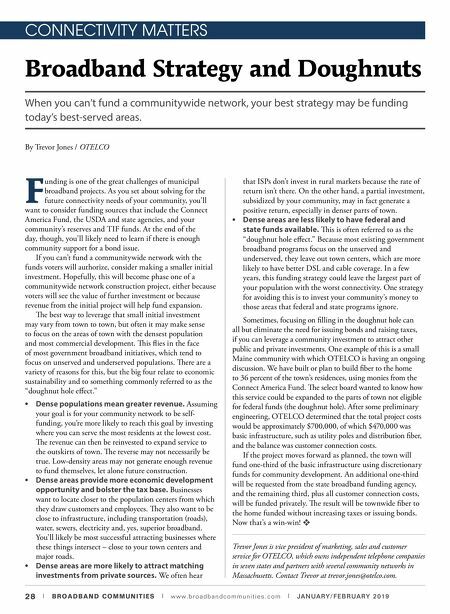 As you set about solving for the future connectivity needs of your community, you'll want to consider funding sources that include the Connect America Fund, the USDA and state agencies, and your community's reserves and TIF funds. At the end of the day, though, you'll likely need to learn if there is enough community support for a bond issue. If you can't fund a communitywide network with the funds voters will authorize, consider making a smaller initial investment. Hopefully, this will become phase one of a communitywide network construction project, either because voters will see the value of further investment or because revenue from the initial project will help fund expansion. e best way to leverage that small initial investment may vary from town to town, but often it may make sense to focus on the areas of town with the densest population and most commercial development. is flies in the face of most government broadband initiatives, which tend to focus on unserved and underserved populations. ere are a variety of reasons for this, but the big four relate to economic sustainability and to something commonly referred to as the "doughnut hole effect." • Dense populations mean greater revenue. Assuming your goal is for your community network to be self- funding, you're more likely to reach this goal by investing where you can serve the most residents at the lowest cost. e revenue can then be reinvested to expand service to the outskirts of town. e reverse may not necessarily be true. Low-density areas may not generate enough revenue to fund themselves, let alone future construction. • Dense areas provide more economic development opportunity and bolster the tax base. Businesses want to locate closer to the population centers from which they draw customers and employees. ey also want to be close to infrastructure, including transportation (roads), water, sewers, electricity and, yes, superior broadband. You'll likely be most successful attracting businesses where these things intersect – close to your town centers and major roads. • Dense areas are more likely to attract matching investments from private sources. We often hear that ISPs don't invest in rural markets because the rate of return isn't there. On the other hand, a partial investment, subsidized by your community, may in fact generate a positive return, especially in denser parts of town. • Dense areas are less likely to have federal and state funds available. is is often referred to as the "doughnut hole effect." Because most existing government broadband programs focus on the unserved and underserved, they leave out town centers, which are more likely to have better DSL and cable coverage. In a few years, this funding strategy could leave the largest part of your population with the worst connectivity. One strategy for avoiding this is to invest your community's money to those areas that federal and state programs ignore. Sometimes, focusing on filling in the doughnut hole can all but eliminate the need for issuing bonds and raising taxes, if you can leverage a community investment to attract other public and private investments. One example of this is a small Maine community with which OTELCO is having an ongoing discussion. We have built or plan to build fiber to the home to 36 percent of the town's residences, using monies from the Connect America Fund. e select board wanted to know how this service could be expanded to the parts of town not eligible for federal funds (the doughnut hole). After some preliminary engineering, OTELCO determined that the total project costs would be approximately $700,000, of which $470,000 was basic infrastructure, such as utility poles and distribution fiber, and the balance was customer connection costs. If the project moves forward as planned, the town will fund one-third of the basic infrastructure using discretionary funds for community development. An additional one-third will be requested from the state broadband funding agency, and the remaining third, plus all customer connection costs, will be funded privately. 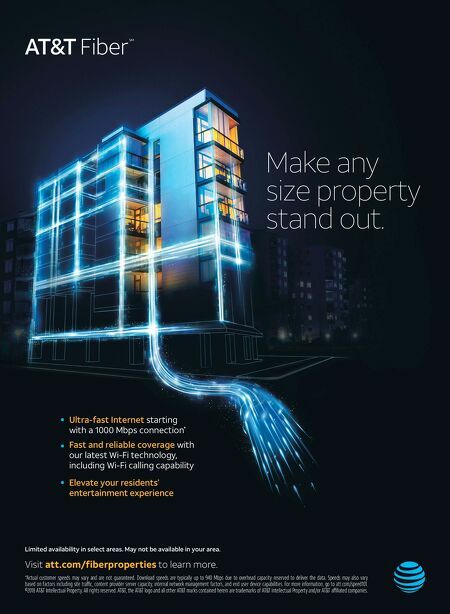 e result will be townwide fiber to the home funded without increasing taxes or issuing bonds. Now that's a win-win! v Trevor Jones is vice president of marketing, sales and customer service for OTELCO, which owns independent telephone companies in seven states and partners with several community networks in Massachusetts. Contact Trevor at trevor.jones@otelco.com.